DUBAI, 3rd May, 2018 (WAM) -- The Smart Dubai Office (SDO) has announced the winners of this year’s global Blockchain Challenge. Ireland’s AID Tech came in first, while the UAE’s Smart Crowd and the USA’s Codex rounded up the top 3 winners from the 17 finalists that will receive a total of USD 45,000 for the exceptional Blockchain solutions presented in the challenge, supporting the strategy that aims to make Dubai the first blockchain-powered city within two years. They will also have the opportunity to network with the right government stakeholders and potentially develop their ideas further in Dubai. "The global Blockchain Challenge is an important empowerment activity that harnesses the entrepreneurship skills of the private sector achieve Dubai’s ambition of being an industry leader in Blockchain and establishing a Blockchain run ecosystem in the city. We congratulate the three winners of this year’s 17 finalists, who came from 17 cities across 14 countries - a statistic that reflects the truly global allure that this competition has generated in the two years it has been running," said Dr. Aisha Bint Butti Bin Bishr, SDO Director General. The 17 selected lead proposals in the second Dubai Blockchain Challenge covered 16 industries, with the finalists undertaking training with technology start-up organization Union, followed by the pitching of their concepts to an audience of government leaders, investors and experts from private and public institutions. 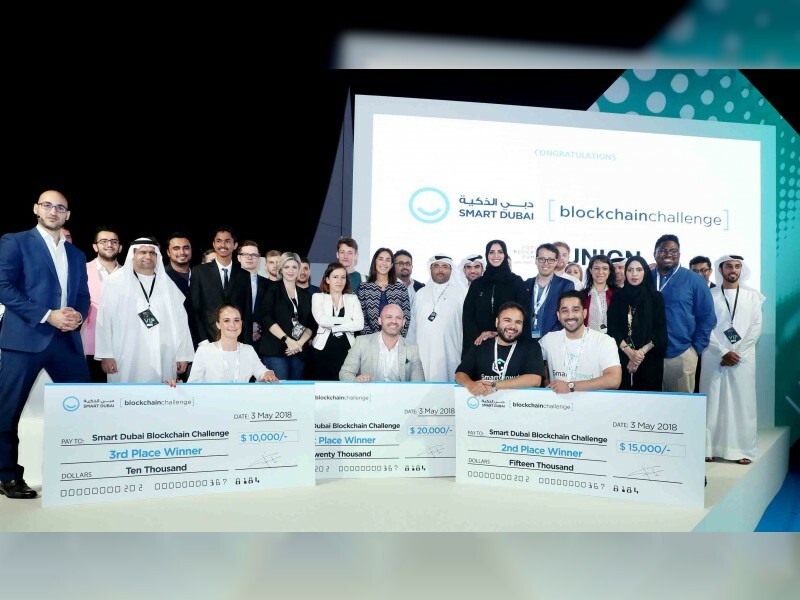 The trio of winners was announced at the Blockchain Challenge Presentation and Awarding Ceremony, which took place within the Future Blockchain Summit at Dubai World Trade Centre. "We are proud of the three winners of this year’s global Blockchain Challenge, and I would like to thank all the 200 applicants who participated from across the world. Start-up challenges such as the Smart Dubai Blockchain Challenge essential to propel the growth of the Blockchain environment in Dubai. The winning start-ups be introduced to the relevant government partners to help them kick start their blockchain implementation in Dubai helping make the city a global benchmark for Blockchain adoption and implementation. "said Wesam Lootah, CEO of the Smart Dubai Government Establishment. The Dubai Blockchain Strategy revolves around three main pillars; increasing government efficiency by transferring 100 percent of applicable government transactions to blockchain; creating a blockchain industry and ecosystem and becoming global leaders in the advancement of blockchain technology. Over 20 government and private sector Blockchain use cases are currently in the proof-of-concept phase, some these include renting and buying a property, obtaining non-objections certificates, managing the lifecycle of a vehicle, licensing medical institutions and doctors, obtaining e-prescriptions, enrolling and managing students, and ensuring food safety.